What is the difference between the Sidereal and Tropical Zodiacs? The question I am most often asked is "In your calendar, why do you have the sun in constellation x on such and such a date when according to my birth chart it is in y?" The questioner usually feels that I must have it wrong or the person who made their birth chart. Could it be that both are correct? There are two different zodiacs. Astronomers tend to use one of them and most western astrologers tend to use the other. There is enormous confusion around them because they use the same names to describe the divisions of the zodiacs .......... Aries, Taurus, Gemini etc. My answer (an answer) to the topic question will be considered from different perspectives. I will start with two quotes from indigenous peoples in diametrically opposite parts of the world. "Everything under creation is represented in the soil and in the stars. Everything has two witnesses, one on earth and one in the sky. Everything is represented in the ground and in the sky." (Australian Ngarinyin Elder David Mowaljarlai). "Wakan Tanka placed the stars in such a manner so what is in the heavens is on earth, what is on earth is in the heavens in the same way. When we pray in this manner, what is done in the skies is done on earth in the same way. Together, all of creation participates in the ceremonies every year.� (North American Lakota Chief Black Elk). "That which is below is like that which is above and that which is above is like that which is below to do the miracles of one only thing"
It comes from an Isaac Newton translation of the Emerald Tablet, an ancient text of the teachings of Hermes the Thrice-Great, the inspirer of the Egyptian culture. �Let there ring out from the heights what in the depths is echoed�. So after hearing these words of wisdom from widely varying sources and yet expressing the same universal law, I will now take a different tack. The Tropical Zodiac is the position of the sun referenced against the earth�s horizon at a particular locale which gives you the seasons as a measure of the flow of time. The framework for the 4 seasons are the 2 solstices and the 2 equinoxes. This is the one most western astrologers use. The Sidereal Zodiac is the position of the sun referenced against the star background, as a measure of the flow of time. The framework for the star background is the constellations the sun passes in front of. This is the one astronomers use. We can measure time by the seasons (tropical time) or by the stars (sidereal time). The sun, as the time hour hand, is common to both. To expand on the nutshell. Tropical Zodiac. Most people know what their birth sign is. They may be a �Leo� or a �Taurus� or one of 10 other signs of the Tropical Zodiac. What does it mean? It means that at the time of their birth, from an earth perspective, the sun was in 1 of 12 zones around the earth. Each of the 12 has an angular length of 300. 12 X 300 =3600. The frame of reference for these zones is the sun�s positions relative to the earth�s horizon. As the sun moves through the seasons its altitude changes and so do the compass bearings of its rising and setting positions. None of these signs can be directly related to a group of stars that can be seen in the skies with one's physical eyes. ����������� Example 1; If you were born on the March Equinox your birth sign would be 00 Aries and the sun would have risen exactly in the east and set in the west. The sun travelled directly over the equator all that day before crossing into the northern hemisphere the next day. March Equinox and 00 Aries are synonymous. ����������� Example 2: If you were born on the June Solstice your birth sign would be 00 Cancer and the sun would have risen in the northeast and set in the northwest. The sun travelled directly over the northern hemisphere Tropic of Cancer all that day. The Tropic of Cancer is as far north as the sun gets in the course of the year (for an earth based observer). �June Solstice and 00 Cancer are synonymous. Example 3; If you were born on the September Equinox your birth sign would be 00 Libra and the sun would have risen exactly in the east and set in the west. The sun travelled directly over the equator all day before crossing into the southern hemisphere on the following day. September Equinox and 00 Libra are synonymous. ����������� Example 4: If you were born on the December Solstice your birth sign would be 00 Capricorn and the sun would have risen in the southeast and set in the southwest. The sun travelled directly over the southern hemisphere Tropic of Cancer all that day. This is as far south as the sun gets in a year. December Solstice and 00 Capricorn are synonymous. ����������� For 6 months of the year the sun travels northward until it is over the Tropic of Cancer, it then turns and travels southward until it is over the Tropic of Capricorn and turns yet again. The word tropic is derived from the Greek tropikos - belonging to a turn. The Sun turns at the solstice points. It turns from getting lower and lower in the sky at midday (heading to midwinter) to start climbing higher and higher (heading to midsummer) and vice versa. ����������� The cross of these 4 signs is the frame of the Tropical Zodiac which is then farther subdivided into 12. To compile the Tropical Zodiac no reference was made to any stars. Let us now look at the Sidereal Zodiac. At this stage it is important to clarify the use of two words. When the word �sign� is used in this article it refers to the Tropical Zodiac and �constellation� refers to the Sidereal Zodiac. Both zodiacs are divided into twelve and they both use the same names, which understandably causes enormous confusion. If your birth �sign� is Pisces it does not necessarily mean that the sun was in front of the �constellation� of Pisces at your birth. Your birth �constellation� is different to your birth �sign�. What earth season (i.e. sun declination or latitude) you were born in is different to what stars where behind the sun at the hour of your birth. The Sidereal Zodiac uses the physical stars visible in the night sky as their frame of reference for the sun, moon or planet�s positions in the sky. The sun, moon and planets do not transit in front of all the constellations in the sky, they only traverse in front of 12 or 13. These are the zodiacal constellations. Whether there are 12 or 13 depends on where the boundaries for the various constellations are positioned. Different cultures and systems have positioned them differently i.e. there is no universal consensus to the boundaries or even to the size of the constellations. Generally speaking the sidereal zodiac (as seen by a person standing on the earth) is that belt of stars 70 either side of the sun�s path (ecliptic) through the sky that is divided into 12 equal sized (300) constellations. This zodiac is like a freeway with a central lane (ecliptic) on which the sun travels. The moon and planets also travel on this freeway but on different lanes. They do, however, cross each other�s lanes at times (nodes). The word sidereal is derived from Latin sidus �star�. Both zodiacs use the names Aquarius, Pisces, Aries etc for their twelve fold divisions. Little wonder that there is confusion! For this article the �signs� use the nomenclature Aquarius, Pisces, Aries etc., and the equivalent �constellations� are named The Water Bearer, The Fish, The Ram etc. Can the two zodiacs be compared against each other? If we represent both of them as spokes on a wheel as done in the diagrams we can superimpose them on a single hub as, in this case, they are both geocentric and the hub is the earth. NB The sidereal zodiac can be considered from a heliocentric perspective too. To align the seasons relative to the stars we now use the sun which is also common to both zodiacs. The sun�s position at the March equinox (00 Aries) is measured against the star background and is currently near the beginning of The Fish constellation. How many degrees into the The Fish depends on which constellation boundaries you are using. By comparing the two wheels you can see that there is a difference of around 250 between them. By making this comparison over time it has been realized that the difference is increasing, the seasons are slowly moving relative to the star background by a degree every 70 odd years. This phenomenon is known as the "Precession of the Equinoxes". It takes 2160 years for the equinoxes and solstices to move backwards through each constellation. This retrograde movement determines our cultural ages. We are in the �Age of Pisces� and moving towards the �Age of Aquarius�. If we now take what has just been covered and go back to the quotes at the beginning of the article we can come to a realisation that the heavenly zodiac (sidereal) is imprinted into the earth (tropical zodiac). This takes us out of the abstraction of wheels (which can be useful) into something more real, if it is correct. The forces behind the stars of the zodiac have their imprint as forces within the earth. The question is then begged: "What is the cause of these forces, where do they come from?" On earth human beings create farms, buildings, works of art etc. That is to say from actions, deeds of beings. Do super sensible beings bring about universal forces through their actions? Creator Beings are described in mythos and sacred books across most cultures. If the tropical zodiac is indeed an imprint of the heavens onto the earth we could map it onto the earth and possibly learn something about the earth and its regions as a consequence. To do this we have a heavenly start point in the sidereal zodiac at 00 of The Ram. We also have a starting point on the earth at the longitude line going through Greenwich in London. 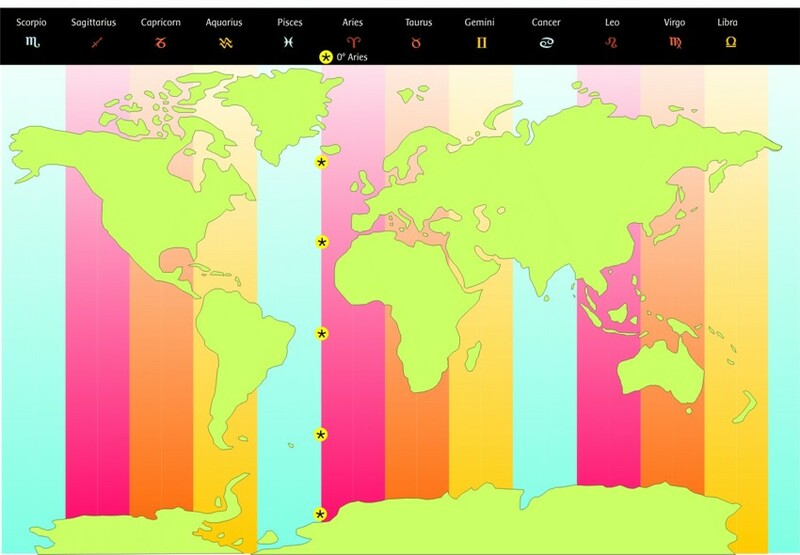 Our time zones are based on these lines or meridians of longitude. NB. The lines of longitude are based on the equator and the geographic poles. The Zodiac is not based on the celestial equator but the ecliptic so what I have said is not a strict equivalency for current times. However I have chosen to take a position that in much earlier times the Earth's axis did not have a tilt and its axis was vertical which would make the ecliptic and the celestial equator the same. Some researchers also choose to take Jerusalem as their 00 longitude point (rather than Greenwich). "Are these starting points arbitary intellectual constructs or has there been some subconscious wisdom at work in humanity?" is another question we have to ask. In my work I have chosen to offset the tropical zodiac 230 (rather than 250 which you could well do) from the sidereal so in order to do this projection of the heavens onto the earth I have lined up the 00 Aries 230 back from Greenwich which takes it to the 230 West longitude going through Iceland. NB to arrive at 230 offset from Greenwich I am using the weather researcher Dennis Klocek�s work (www.weatherdoc.com). I have done so because he is a respected current day researcher in the realm (weather) that I am investigating. I have yet to form conclusions about its validity. I have given a fairly elaborate answer to the question of the differences between the two zodiacs. Other answers could also be given and be valid. As modern human beings we are very comfortable in the spatial, and the descriptions of the zodiac have been for the most part very spatial to explain the differences. The article does not set out to explain the zodiacs, nor does it set out to explain the causes of these flows of time. �Many spiritual creators are on top but with their songs under the earth. All the Dreaming stories come down, the Dreaming songlines, everybody�s song goes off to the salt water and back, to start again�. ".............for the father spirit of the heights holds sway in depths of worlds"
" .......... may there ring out from the heights what in the depths is echoed"
".......... let their be prayed from the depths what in the heights is granted"
Which Zodiac is used in Biodynamic Agriculture? Both are actually used even if it is not immediately apparent! When we are first introduced to a biodynamic calendar it is often stated that the sidereal zodiac is used in biodynamics, the star zodiac. NB Peak Ascension and Descension are referred to in all BD calendars but equatorial crossings are only covered in the Antipodean Astro Calendar and Northern Star Calendars compiled by Brian Keats. The four ingresses mentioned above are key considerations for long range weather forecasters. Astrologers also use a system of �houses� for their interpretations. What is the house system? its lowest point below the horizon - Imum Coeli. From this fourfold framework there is a farther trisection giving 12 zones or houses. These houses are horizon dependant and latitude affected whereas the �signs� are longitude dependant. There are many house systems. The chart below shows a equal-sized house system from a northern hemisphere perspective (east is on the left side). Where the sun, moon or planet is relative to the horizon is important in weather forecasting especially for the timing of an event within a 24 hour framework. The Antipodean Astro Calendar and the Northern Hemisphere Star Calendar has the essential foundation of the house system (4 key positions -ascendant, MC, descendant and IC) built in for the moon. They can be also be deduced for the planets from the information in the calendars. To work out the houses for the planets you have to refer to the monthly Sky at Sunset chart in the calendar. It is too easy to say that the sidereal zodiac or the tropical zodiac is the "right" one to use. What often appears to be polar points of view can both be right or, at the very least, aspects of both be correct. Sometimes we just have to couch the other�s perspective in our own terms. ����������� If you join Aries, Cancer, Libra and Capricorn (the cornerstones for the solstices and equinoxes)� a cross is obtained. To look at another stream of time you can observe (with your thinking) how these cornerstones move against the star background or Sidereal Zodiac. The cross of the Tropical Zodiac is set against the Sidereal Zodiac. It will be found that this cross moves very slowly (10 every 72 years) backwards through the stars. The Solstices and Equinoxes do not occur against the same star background year in and year out, but gradually process. This phenomena is known as the Precession of the Equinoxes and the complete cycle takes around 25,920 years. Currently, in Australia, we experience our Summer Solstice in Sagittarius. Half a cycle into the future (1296 years), the southern hemisphere will have its Summer Solstice in Gemini - as the Northern Hemisphere currently experiences it. This great period of time, known as a Platonic Year, has been measured to be 25,770 years. As this phenomena has only been measured with great accuracy for a short period of time there might be some change to this figure in the future. People seeking the wisdom behind a number reckon the Platonic Year, or a year in the life of Brahma (comparatively speaking), to be 25,920 years. ����������� One arm of the cross, the Aries arm, is taken as the "hour" hand for this long period measure of time to give us our so called Ages. We are currently in the Age of Pisces. This is determined by finding the Sun's position against the star background (Sidereal Zodiac) at the Spring Equinox in the Northern Hemisphere (00 Aries of the Tropical Zodiac). The Sun will be on the Ecliptic (as usual) and the� Celestial Equator� (only happens twice a year at the equinoxes) . 00 Aries is where the Tropical Zodiac begins - the Northern Hemisphere tropical year cycle begins in Spring. Currently 00 Aries (Tropical) is around 50 Pisces (Sidereal). We are in the Age of Pisces and 00 Aries (Spring equinox) is heading backwards towards Aquarius where the dawning of a new age awaits us. It is definite that the Sun is approaching the start of Pisces as can be seen in the drawing below. Exactly where we take the beginning of Pisces and the end of Aquarius to be is a moot point. It depends where you set the boundaries between the two; there are differences of opinion. If the equinox is at 50 Pisces; the Age of Aquarius will have its astronomical beginning in 2360. ����������� When the Age of Aquarius does get fully under way� (it is dawning) there will be great cultural and other changes. The world will be completely different from when the Age of Pisces began.� The Earth s will be under the influence of new spiritual impulses to take it and us farther on our evolutionary� journeys. This� seemingly abstract notion of the Precession of the Equinoxes has a profound effect. ����������� On average the Aries point will take 2160 years to go through each constellation of the Zodiac i.e. the average length of a cultural age is 2160 years. Our age, Pisces, began around 63 AD. and Christ entered into the world just prior to this as the Aries Age was setting. Christ is referred to as the Lamb of God in deference to the cultural age (Aries). He is also associated with the symbol of the Fish (Pisces). He came at the dawn of the Age of Pisces bringing a mighty impulse for change� to our age. We are still coming to grips with this impulse and need the whole cultural age to come to terms with this sublime mystery! ����������� If one studies closely� the mythologies and symbols of past cultures you will find references to the constellations of the March Equinox. Jason went in search of the Golden Fleece (Greek times); the Egyptians worshipped the Apis Bull; and the Persians had a duality in their theology Ormuzd, the God of Light and Ahriman the God of Darkness (Gemini, the Twins are a symbol of duality and bisymmetry). ����������� Not only is this great rhythm expressed in the cultural cycles but it is also inscribed into our organism. Look at the archetypal Human Being who� takes� 25,920 breaths a day , live 72 years and has a pulse rate 72 to the minute! ����������� Back to the cross (of equinox and solstice points) circling through the Zodiac. The 4 arms to the cross are referred to as 4 pillars or legs in our mythologies. They either support the World or keep a separation from the Sky� and the Earth, whilst still maintaining a link between them.� They can also be seen as the bridge between the conscious and unconscious part of ourselves. Whenever the World undergoes a change it needs 4 new �legs to stand on -� and the old ones must be destroyed. Old, decadent structures have to be taken down before� new impulses can take its place. Jesus comes into the Temple, where the moneylenders were, and swept away the table. He brings the new! Previously Samson had to collapse some pillars to bring about change. The Earth had to link up to different parts of the Heavens. ����������� Currently these 4 pillars stand in the constellations (Sidereal Zodiac) of Pisces, Gemini, Virgo and Sagittarius. These are the constellations where the Equinoxes and Solstices take place. ����������� The Solstice points, have� also� been imagined as� the Human Being's gateways between� the Earthly sphere and Spiritual realm.� Each year the Sun climbs to its Summer solstice point ............ it then stops, turns and goes back down to its winter stopping and turning position. Sol-stice is derived from Sun-stand still. Entry from the Heavenly realm of the Stars to the land of the living is� through Gemini; and the exit to the land of the dead, the unconscious realms,� via Sagittarius� -� Gemini and Sagittarius being our current� solstice constellations. ������ Why were� some� temples (like those of the Egyptians) designed to be facing the setting Sun at the Summer Solstice?� It would seem that at every Summer Solstice, when the Sun is at its highest and most glorious, there is the possibility for impulses from� the Cosmos to pour into the Earth. On the other hand, temples were also built to align with� the Winter Solstice, where the Sun would be at its lowest, it would be entering into the realm of Hades, the Prince of Darkness. The Sun's brilliance is dampened as the Sun Being has His deepest entry into matter. Darkness, density� and matter are synonymous; as are immaterial rarefied spiritual states and light. Temples have been to all 4 key annual solar positions - the Solstices and the Equinoxes. The Equinoxes could be seen as the solar positions holding the balance between light and darkness, spirit and matter, the Cosmos and the Earth. ����������� �What makes the current situation more interesting� is that sidereal Gemini and Sagittarius not only take us into the starry spheres of the Zodiac, but right into the Milky Way part of the Celestial Sphere.� The Milky Way, physically, is a vivid picture of our galactic equator; our galaxy being the Milky Way Galaxy. Gemini and Sagittarius, as well as being our Solstice places,� are also the constellations where the Milky Way crosses the Ecliptic.� They are the nodes, the link or bridge, between the Milky Way, Ecliptic and the Earth. To be more precise the� Galactic plane passes through 10 Gemini and 20 Sagittarius which are immediately adjacent to the solstice positions (less then 10 away). ����������� When might the gateways to the Galaxy be open? We've all experienced the magical quality of a Sunrise or Sunset, having the Sun on our horizon. On these occasions we can also look to see where the Milky Way, even more grand than the Zodiac, intersects with our horizon. Inclined at 620 to the ecliptic, it sometimes� is to the North and South, sometimes to the East and West - it weaves a merry dance around all the compass positions. We can see Gemini (in the Milky way and the Zodiac) on the horizon to the North East at the Summer Solstice sunset (Southern Hemisphere viewpoint) but this particular galactic gate� would be� closed, or� partially closed. We can never see physically the more sublime happenings of the heavens as they take place in the blinding brilliance of the Sun's aura. When the Sun is in a particular constellation, that part of the heavens is opened and the beings behind that Zodiacal constellation pour forth their unmitigated power. The event� is far too mighty for us to be able to see. When the Sun moves on, and we can see the stars of that constellation again, the beings behind those stars� "avert their gaze", so to speak. That is to say, their full power is not directed Earthwards and we are able to gaze at their facade, the stars. ����������� We are able to partially see Gemini gate to the Milky Way at the Winter Solstice and partially see Sagittarius gate� at the Summer Solstice. ����������� Does the Earth horizon opens our way to the Sun;� the Sun� release� the powers of� a� Zodiac constellation;� the Solstice Sun in Gemini and Sagittarius opens the portals to the Galaxy ? ����������� It is interesting to note that when the Milky Way� began housing the Solstice points, and disappearing behind the veil of the Sun,� a whole string of high initiates who founded religions came� to Earth - Pythagoras, Gautama Buddha, Lao Tze, Zoroaster and Muhammed. The central world religion founder was Christ. Did they pour in from the Milky Way when we began to lose sight of the Milky Way on the horizon at the Solstices, when the Milky way portal was behind the Glory of the Sun? ����������� We have had no major new religions founded (many new interpretations though) since� Gemini and the Milky Way began to be visible again on our horizon at sunset at the December solstice i.e when Gemini began its heliacal rising. ����������� What does the future hold? The Solstice points are still travelling through the Milky Way, and� are approaching the central plane (Galactic Equator) which one could imagine to be a� key point in Space and Time. What happened nearly 26,000 years ago when such an event occurred before? How will such an event in itself have evolved?